Visual Colour Effects: There are fireworks available in one colour, or in multi-colours. Perhaps you might want to celebrate a golden wedding and have all shots in a golden colour – then coloured firework effects is something to consider. An example of a single coloured firework is Maximum Showtime, whereas a multi-coloured firework would be The King of Colour. Visual Direction Effects: Depending on the space you have to light your fireworks, you will want to consider the directional firework effects. Some fireworks will fire straight up – which is better if there are overhanging trees for example. Other fireworks will have shots going from side to side and therefore have a much wider spread. You will need a bigger space for this. You can see some firework videos on our website to demonstrate this. A straight up firework would be The Dark Angel. A side to side firework is Zero to Sixty. Visual Shape Effects: When the shells within fireworks are manufactured, they are made to break in different ways. This produces different shapes of firework effects. Some of the most common ones are listed here. Stars – These are small glowing balls of fire which shoot from the firework. These are most commonly found in Roman Candles, for example Shooting Stars which is available at Fireworks Den. Bombettes – These are much like stars, but finish with a small explosion. These can be seen well in the video for ‘Lightening Strike’ in our 24 Shot Assortment. Trails – These are the shapes left behind in the sky once the main shot has exploded. There are so many variations here, and many are very similar. Some of our favourites include palms and willows (seen in The King Rocket); brocades and chrysanthemums (seen in the Big Mama Rockets); and Serpents (seen in Catherine Wheels in the Sky with Diamonds). Bangs and whistles can be heard in Inferno, and Crackles can be heard approximately 50 seconds into the video for Sky Thriller. Now sit back and enjoy. Consider what effects you want from your fireworks, then come and speak to the experts here at Fireworks Den, or contact us on the phone, and we can help you choose the best option for you. We look forward to helping you soon! 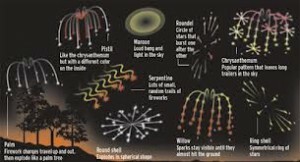 This entry was posted in About Fireworks, Firework Effects on April 16, 2013 by Becky.